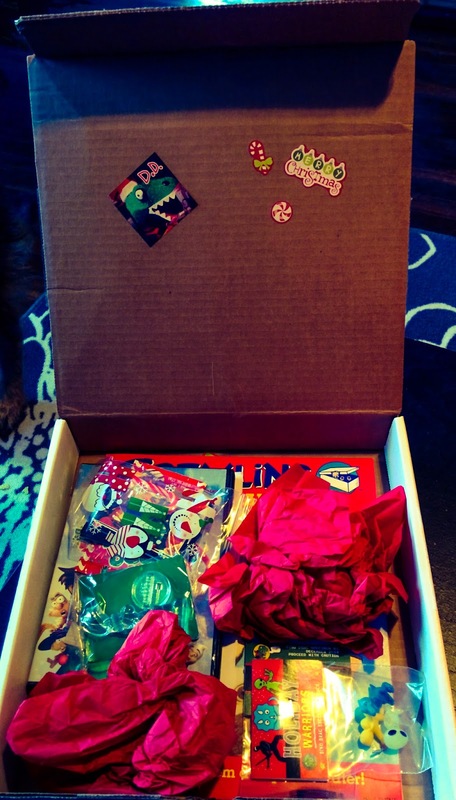 Mail Call: Dino Drac December '14 Funpack is here! It's that time of the month again -- no, not that time -- and the Dinosaur Dracula December 2014 Funpack has arrived on my doorstep! Once again, Matt nails the holiday goodness! And instead of a list of contents this time around, wee given instructions on how to enjoy the contents! Pop in the included "Holidaze: The Christmas That Almost Didn't Happen" DVD. Sit on the floor and review the rest of your Funpack's contents while the movie plays. Page through you new/old Gremlins sticker album. Ain't it great?! Look in the Ziploc bag for a few stickers to get you started. There's some other neat stuff in there, too! Occasionally look up at the movie, and see if you recognize Edie McClurg's voice. I love her. Take great pleasure in the latest Dino Drac Specimen -- a real film cell from A Christmas Story! Check out your Holiday Warriors 3-Pack! Why not draw and color them on the back of this page? Hang your 1992 Energizer Bunny promotional tree ornament! Put your December 2014 Dino Drac Mini-Poster on the fridge! Eat those Candy Cane Pop Rocks! They're minty and they'll feel weird on your tongue! Needless to say, I'm going to enjoy the hell out of this Funpack. I'm going to mix those Pop Rocks with some Pepsi. That should go well. And honestly, I think my son will love HOLIDAZE: THE CHRISTMAS THAT ALMOST DIDN'T HAPPEN. So thanks, Matt -- and Happy Holidays!